Splig is a lieutenant in the Descent: Journeys in the Dark (Second Edition) base game. Goblins rule through simple tyranny and by bullying smaller goblins. 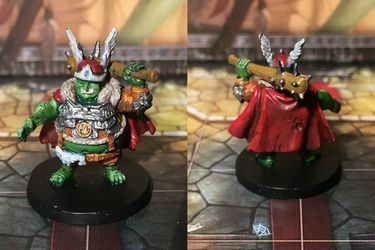 Splig, by virtue of being the biggest goblin, is always the leader. And because he is the leader, he gets all the food. And because he gets all the food, he's the biggest goblin. Splig likes the way this works! Not Me! : Each time Splig is attacked, before the dice are rolled, test his . If he passes, a monster adjacent to him becomes the target of the attack. Range and line of sight are still measured to Splig's space. Promotion: Splig tests . If he passes, you may replace an adjacent minion monster with a master monster of that type. This may not exceed that monster group limit.